Let me start off by defining BHAG. 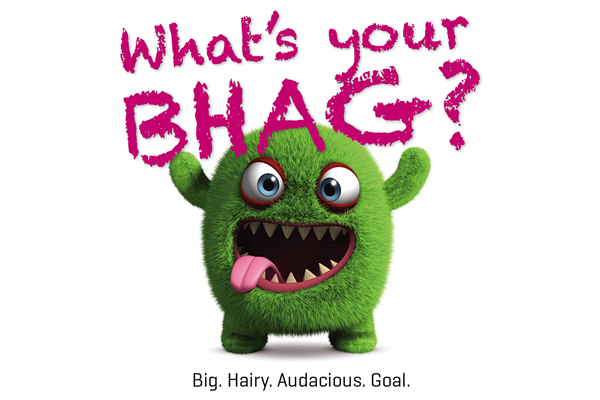 BHAG is a Big, Hairy, Audacious Goal. It’s the kind of goal that scares you a little bit. You might think, I can’t do this, It’s too large and It will be difficult. I encourage you to go after that BHAG with all your might, work day and night for it. Decide that the BHAG is MINE and no one will stop me from getting it. I have set a BHAG so large that I shake when I think about it. It is so good for me and my family that it will change our lives it will cause a SHIFT in my life and everyone that I am associated with will be blessed. I think we might stop our progress when going for goals because we can’t see how they will come together but today I challenge you to set your BHAG and don’t worry about how you will reach it, just BELIEVE and WORK and I know YOU WILL see it come together.